Family Sharing: What is it? How do you use it? 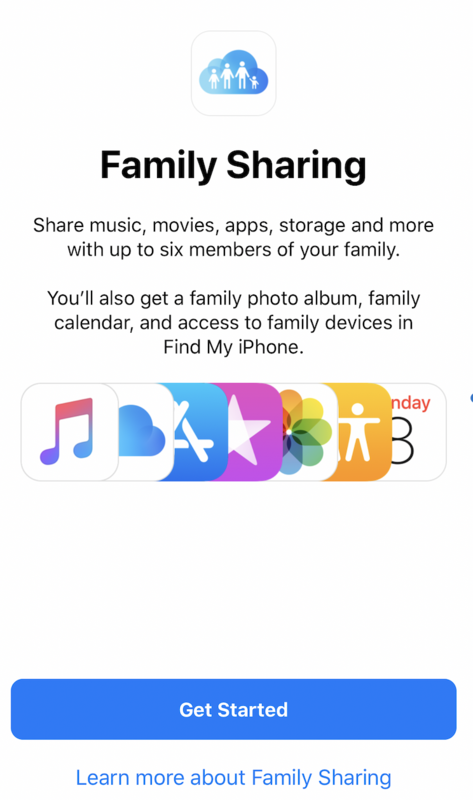 Family Sharing is a feature that comes with Apple products that allows you to share data with up to five family members. This includes the applications: iTunes, App store, Apple Music, iCloud storage, Apple Books, Photos, Calendar, and Find My iPhone. One member of your family can set Family Sharing up by selecting the features/applications you want to share with each other and then inviting everyone to join. A perk of using Family Sharing is sharing an iCloud storage plan. This would save you money on buying individual plans for each member. The best part of utilizing this feature is that each member only has access to their own photos or files, but you can see how much storage each person is using. This makes it easy to upgrade if everyone is using a large portion of the available storage. Purchase sharing will automatically share all apps, books, movies, and music with all members of the family. The purchased tab allows you to see what each member has purchased, unless you select to hide them from the other members of the Family Sharing plan. From there, you can select what you would like to download and begin listening or playing the content. There is increased control given to the organizer since all purchases are billed to their account. If you have children with devices, you can turn on “Ask to Buy” to screen all of their purchases before they make them. This can be applied to paid or free downloads. Apple Music allows you a family plan option so everyone can access the full Apple Music library. Each member can create their own customized library and playlists. There is a free three month trial if you still deciding if you would like to subscribe to these music services. With Family Sharing, you have the ability to see everyone’s locations to check in and make sure someone made it where they needed to be. This makes it easier to locate lost or stolen devices with Find My iPhone access shared with everyone. Screen Time, if shared, shares the reports of how time is being spent on each members’ devices. For this feature, you can share the access of viewing kids’ screen time with another parent or guardian. Family Sharing will set-up a shared photo album and a shared calendar on everyone’s devices. Sharing family vacation photos and family dinner night plans will be easier than ever. Overall, Family Sharing helps families stay connected and up-to-date with each other’s schedules. It can be a helpful resource to use with a wide variety of sharing options.